Each week we highlight a different game built with Buildbox. Our ‘spotlight’ picks are games that have done well on the charts or are new indie releases that feature a cool theme or gameplay concept. This week’s spotlight is Petri Game’s Pixel Pounce. It features a cute pixel art style and fun joystick controls. In Pixel Pounce, players get to guide cute pixel characters in a never-ending adventure up high in the clouds. Somewhat similar to Mega Jump or Doodle Jump you have to bounce upward from platform to platform. Timing is everything. If you fall, it’s game over! There are also two different control options for players in Pixel Pounce. You can tap/hold on the right or left side of the screen to move or enable the joystick control feature. In joystick mode, players can slide their finger across the screen to jump onto platforms in either direction. The game also has a playful twist. Instead of collecting traditional coins for points, in Pixel Pounce players have to collect slices of pizza to earn a high score. There’s also super magnets power-ups that you can collect that will instantly draw slices within distance to you. The theme in this game is adorable as well. There are tons of cute pixel animal characters that you can unlock. Choose from over a dozen pixelated animals from Mrs. Cluckers the chicken and Beatrice the bee to Bennett the bunny, and more. If you’re a fan of the pixel art and you enjoy games like Doodle Jump, then you should check out Pixel Pounce. 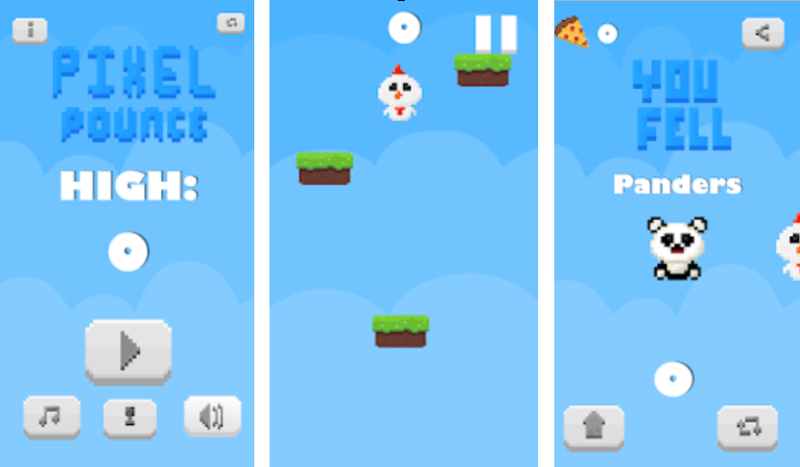 Pixel Pounce is available for download on Google Play. We love showcasing your games! Our Buildbox Game Spotlight and #FreeGameFriday Spotlight is an additional way to get your new game promoted. Every Friday we’ll select a game to feature. These games will also be added to our official Showcase page. So, if you’d like to be considered for next week’s spotlight, be sure to share a link to your game on our forum or Discord server in the ‘games showcase’ sections. You can also share your App Store link with us on social media via Facebook or Twitter with the #Buildbox hashtag for consideration. Congratulations to Petri Games on Pixel Pounce! It’s always neat to see the new exciting games that our customers make with Buildbox. Make sure you check out our special Friday game highlight each week to support other game developers and get inspired! Hi Tiana .Did you see that? Hi Emin :) will check it out. Thanks!